Thankful. Grateful. Giving thanks. Gratitude. These are a few terms that go hand in hand with Thanksgiving. It’s a day set aside to give thanks, be with family and friends eating all things yummy. Even though most of us shutter at the thought of last-minute treks to the grocery store in search of that forgotten box of cornbread or the bobbing and weaving against traffic on the way to Grandmas; Thanksgiving is a day to give thanks. Tap into the power of gratitude and how to achieve it. How great is that? Gratitude. There are seasons in life where we will grapple with how this can even be possible. 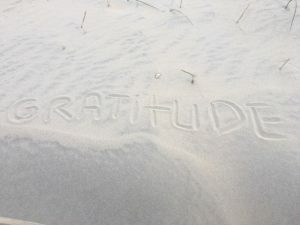 My challenge to you today is to take a step back and ask yourself, “How is my gratitude barometer looking?” Are you giving thanks and going beyond yourself on a daily basis? I can say with confidence, being a person of gratitude and making concerted efforts to think outside of yourself has the ability rock your world. I am not saying being grateful will annihilate battles with addiction, mental health and illnesses. What I am conveying is that there is power in a mindset that trumps negativity. In every situation, negativity is toxic, destructive and potentially paralyzing. There is power in gratitude! I promise. I worked with a student a number of years ago while interning at a rehab facility in North Carolina. This young person faced an onslaught of mental health issues with loved ones, was mired in on-going poverty and the uncertainty of where the next meal was coming from. We made sure Thanksgiving Dinner was provided for his family, but when I asked about the remainder of the holiday and what was and wasn’t available they turned to me and said, “Lawler, it’ll be fine we’re all together.” The spark in their eye and smile on their face humbled the heck out of me. Nothing else mattered. Be grateful. The lenses we choose to use for our outlook on life is up to us. The lens of gratitude can be mind blowing. So, how does this happen? Give thanks: We are blessed. No matter what the state of your life, there is something to be grateful for. Take a few minutes before you begin your day to give thanks. On my way to work every morning I pray. Part of my prayer is giving thanks for the many things I am humbly grateful for. Verbalize your gratitude. Say thanks: There are people in your life who make you a better person, challenge you or bring a smile to your face. Begin expressing your gratitude verbally, via text or in a card. It goes far. Pursue thanks: The reality is that people around you are hurting and facing challenges. It may be a neighbor who recently lost a child, a friend who is suffering from depression, an acquaintance with a spouse overseas; every single one of us has a story and challenges. Extend yourself to someone else. write an encouraging note, invite someone over for dinner, rake leaves, give a hug, ask coffee date, adopt a person in need for the holidays, wave and say hello to someone in a funky place every single time you see them, ask someone how their day is and listen, go to a retirement center and play cards with someone who doesn’t have visitors, drop off a cup of coffee to the gas attendant working in the cold and rain, assemble a care package and drop it off to your local Ronald McDonald House or Women’s shelter, tell someone you never have before something you appreciate about them, make a little extra for dinner and send it over to a neighbor who may be eating alone, pray for someone who is struggling. 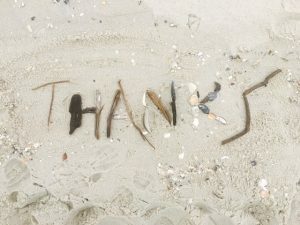 Write thanks -30 day challenge. For 30 days take a few minutes at the end of your day to either write in a journal or put little notes in a jar giving thanks for something or someone. When we take time to pause, reflect and write what we have to be thankful for it reinforces our perspective. In all things, give thanks. No matter where you are today or even if you’re outside of the States and sitting around the table noshing on turkey seems strange, I challenge you to assume an attitude of gratitude. Be thankful. I wish you a blessed, meaningful and grateful Thanksgiving.